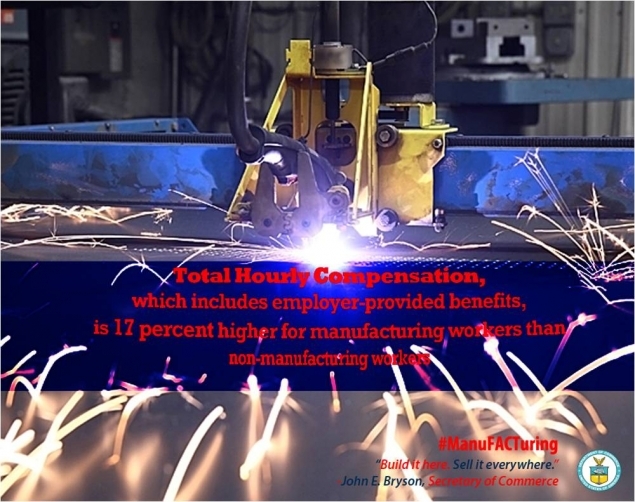 Home › The Commerce Blog › 2012 › May › Economic and Statistics Administration Releases Report on "The Benefits of Manufacturing Jobs"
Economic and Statistics Administration Releases Report on "The Benefits of Manufacturing Jobs"
Today the Economic and Statistics Administration released a report entitled "The Benefits of Manufacturing Jobs" (PDF) that explores benefits to workers and to our nation of a strong manufacturing sector. 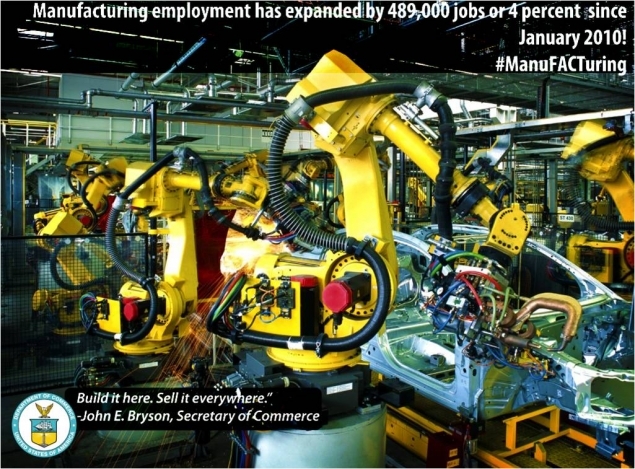 The current economic recovery has witnessed a welcome return in manufacturing job growth. Since its January 2010 low to April 2012, manufacturing employment has expanded by 489,000 jobs or 4 percent— the strongest cyclical rebound since the dual recessions in the early 1980s. From mid-2009 through the end of February 2012, the number of job openings surged by over 200 percent, to 253,000 openings. Coupled with attrition in the coming years from Baby Boomer retirements, this bodes well for continued hiring opportunities in the manufacturing sector. 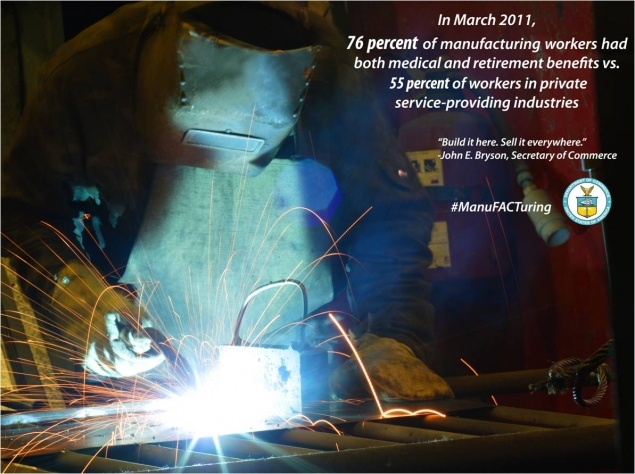 The Benefits of Manufacturing Jobs"
Submitted on May 9, 2012 - 3:30pm. Knowing that jobs are being created and opening in the manufacturing field gives me great relief of what our world is coming to. Thank you for this report that is open to the public. Submitted on May 10, 2012 - 8:20pm. After years of denigrating factory jobs and workers as dirty, blue collar and somehow inferior, it’s about time we realize the economic impact of this undeniable source of added value and appreciate the contribution they make to increasing our standard of living. We cannot all be "knowledge workers." Not only do we need goods as well as services, we need meaningful jobs for people of all interests, talents and abilities.